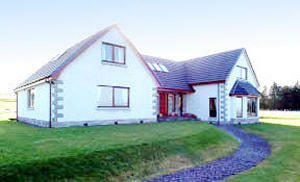 Eiland View offers high quality Bed & Breakfast Accommodation with full en-suite facilities, near Inverness, Scotland. Eiland View is a purpose built new house situated in the countryside on the outskirts of Inverness. The grounds are beautifully landscaped with a large private car park. We offer a high level of comfort and services throughout, with ground floor accommodation for guests, the bedrooms leading from the spacious hallway which boasts a most attractive staircase. All rooms are tastefully decorated with full en-suite facilities. In each bedroom you will find colour T.V.s, clock radios, hospitality trays, ironing boards, hairdryers and for the colder evenings, electric blankets. Accommodation consists of one double room with king size bed and two twin rooms - all very spacious. From an elevated position, the house enjoys a spectacular panoramic view over Inverness, the Moray Firth and the Black Isle with Ben Wyvis in the distance. The sunset view, if experienced, can be breathtaking. Also, in winter, the snow capped hills can look stunning. Please note that we are a non-smoking establishment. Payments may be made with cash in sterling. We also accept Mastercard/Visa/Delta. From £38 to £48 per person per night for bed and breakfast sharing a double or twin room. £55 per person per night for Bed and Breakfast in a single room.